This light weight 8×6 rolled lip wheel features a multi bolt pattern 4/110 & 4/115 fitting many youth quads. Light weight rolled lip wheel designed for the mini quad. Tested by Multi-AMA Champions Doug Gust & John Natalie’s mechanic Casey Greek and designed by former DWT’s GM & now President of Goldspeed Products. New designs and offsets now available in the Goldspeed Brand. 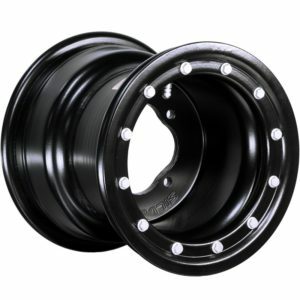 Rolled Lip 8×6 (2+4) 4/110-4/115 "Black Finish", Rolled Lip 8×6 (2+4) 4/110-4/115 "Polished Finish"